Peace be upon you, O intimate servant of Allah. Peace be upon you, O Allah’s argument. Peace be upon you, O Allah’s light in the darkness of the earth. Peace be upon you and upon your fathers. Peace be upon you and upon your descendants. Peace be upon you and upon your loyalists. so, (please) intercede for me with Your Lord. but he then submitted and confessed. then You are the All-excellent Lord. then let Your pardon be very excellent. Peace be upon you, O pleased and pure. Peace be upon you, O Allah’s intimate servant. Peace be upon you, O confidentially talked by Allah. Peace be upon you, O Allah’s emissary. Peace be upon you, O Allah’s secret. Peace be upon you, O Allah’s brightness. Peace be upon you, O Allah’s brilliance. Peace be upon you, O Allah’s Word. Peace be upon you, O Allah’s mercy. Peace be upon you, O shining light. Peace be upon you, O rising full moon. Peace be upon you, O pure who is the descendant of the pure ones. Peace be upon you, O immaculate who is the descendant of the the immaculate ones. Peace be upon you, O greatest sign. Peace be upon you, O grandest argument. Peace be upon you, O purified from slips. Peace be upon you, O deemed above unforgivable failings. Peace be upon you, O raised high against imperfect traits. Peace be upon you, O pleased in the sight of the honorable ones. Peace be upon you, O pillar of the religion. the cornerstone of faith, and the interpreter of the Qur'¡n. has been on deviation and perdition. I repudiate these in the presence of Allah and you in this world and in the Hereafter. Peace be upon you as long as I am existent and as long as there are day and night. and intercessor through whom Paradise is won. and whose servitude has been admitted by You. You may then pray Almighty Allah for your personal requests and they shall be granted, Allah willing. and with the most excellent blessings that You have ever conferred upon any of Your intimate servants. And peace be upon you, O Allah’s most intimate servant. and descendant of the Prophets’ successors. and showing loyalty to your loyalists. You may then pray to Almighty Allah to grant you your personal needs. Mu¦ammad the son of `Al¢ the Magnanimous. and served Allah sincerely until death came upon you. and passed away as martyr. then should I achieve a great success. You may then kiss the blessed soil (of the tomb) and place your right cheek on it. You may then offer the two-unit prayer of ziy¡rah after which you may pray Almighty Allah for any thing you want. O Allah, You are the Sustainer and I am the sustained. You are the Creator and I am the created. You are the Owner and I am the owned. You are the Granter and I am the beggar. You are the Provider with sustenance and I am the receiver of sustenance. You are the All-powerful and I am the powerless. You are the All-forceful and I am the weak. You are the Aide and I am the seeker of aid. You are the Everlasting and I am destined to die. You are the Significant and I am the trivial. You are the Great and I am the tiny. You are the Lord and I am the slave. You are the Almighty and I am the humble. You are the Elevated and I am the meek. You are the Manager and I am managed. You are the Eternal and I am mortal. You are the Judge and I am judged. You are the Resurrector and I am resurrected. You are the Rich and I am the poor. You are the Ever-living and I am subjected to death. but I cannot find anyone to have mercy on me other than You. and my entertainment with You, O All-generous. or less or more than that. lest I will follow my own desires without finding true guidance from You. verily, You guide whomever You wish to a straight path. You may then pray to Almighty Allah for your personal requests and they shall be granted, Allah willing. * The trust in Allah is the price of everything that is precious and the ladder to every goal which is high & sublime. * One who follows his desire, concedes to the wishes of his enemy. As a man asked him for an advice, Imam al-Jawad (A.S.) said: Put your head on steadfastness, embrace poverty, reject the lusts, oppose your passions, and know that you cannot be out of Allah's sight. Consider how you should behave, then. Allah revealed to one of His prophets: Your asceticism will give you comfort. Your devotion to Me will endear you to Me. But, did you antagonize My enemies and cherish My disciples? It was related that highway robbers stole the large amounts of cloth that belonged to Imam al-Jawad (A.S.). The head of the caravan sent the Imam a message in which he informed him of that news. The Holy Imam (A.S.) answered him: Our souls and riches are within the pleasant gifts and the deposited loans of Allah Who makes us enjoy some of them pleasantly and delightedly and seizes whatever He wills with rewards and merits. He whosever intolerance overcomes his steadfastness will waste his rewards. Allah protect us against so. He who detested a matter that he witnessed is as same as those who were absent from it, and he who was absent from a matter that he loved is, as same as those who witnessed it. He whoever listens to a caller is serving him. If the caller was Allah's representative, he is then serving Allah. If the caller was the Shaitan's representative, he is then serving the Shaitan. 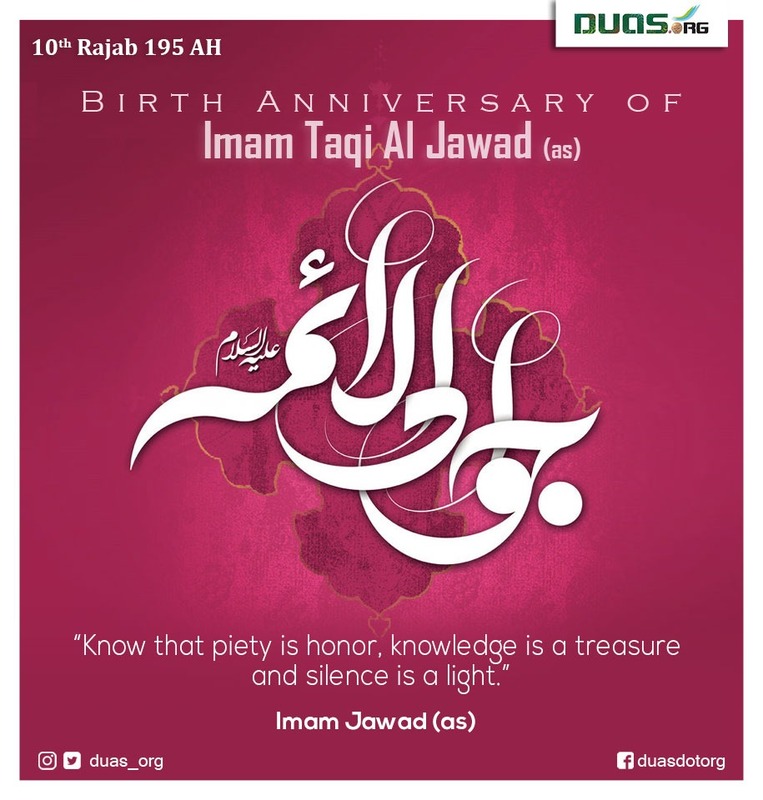 Dawud-bin-al-Qasim related: I asked Imam al-Jawad(A.S.) about the meaning of 'Samad'. He said: Everything that lacks navel is 'Samad'. I said that people claim that 'Samad' is everything that lacks interior. Imam al-Jawad(A.S.) commented: Everything that lacks interior lacks navel. 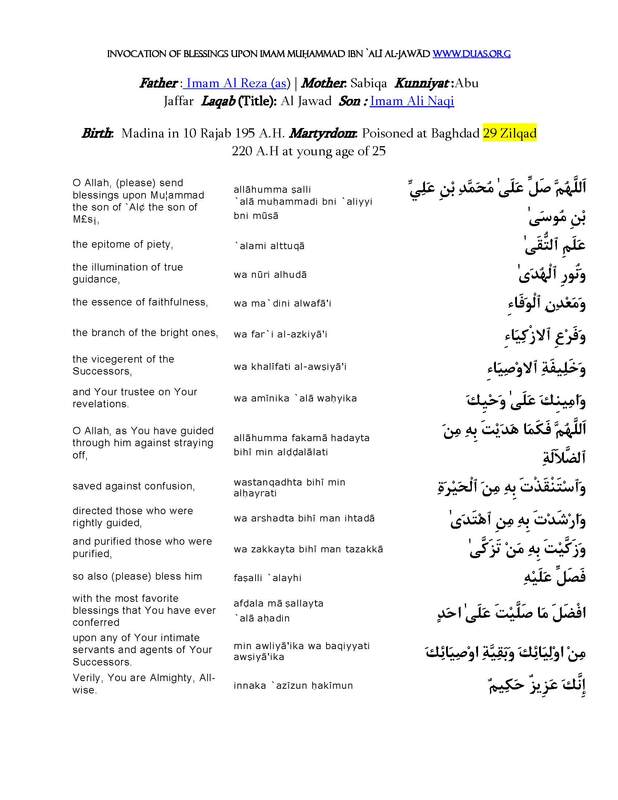 Abu-Hashim al-Ja'fari related: On the wedding day of Imam al-Jawad (A.S.) and Ummul-Fadhl, daughter of Al-Ma'mun. I said: O master, the blessing of this day is clearly great for us. 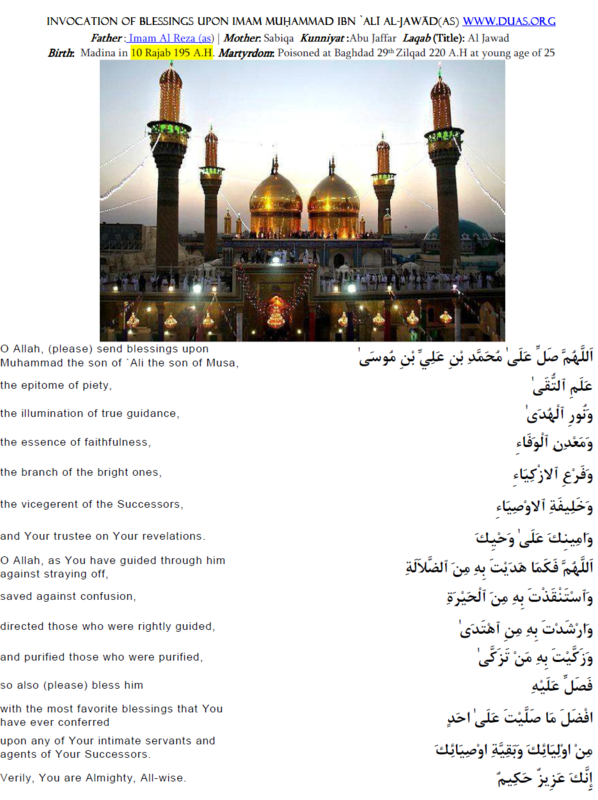 The Holy Imam (A.S.) replied: O Abu-Hashim, Allah's blessings in this day have been great for us. "Yes, master," I said, "What should I say about the day?" 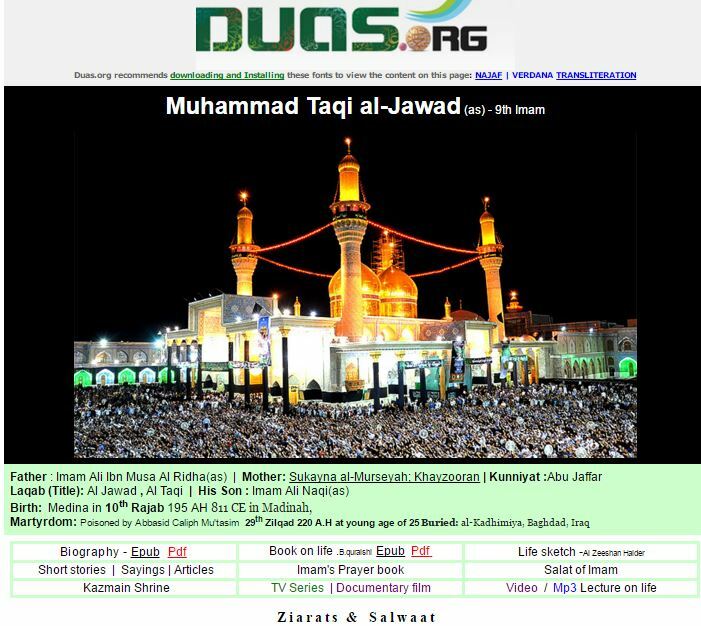 Imam al-Jawad (A.S.) answered: Say only good things about the day so that you will be given from these good things. "Master," I said, "I will follow this instruction completely." Imam al-Jawad (A.S.) said: You will be guided to the right and you will see only the good if you adhere to this instruction. 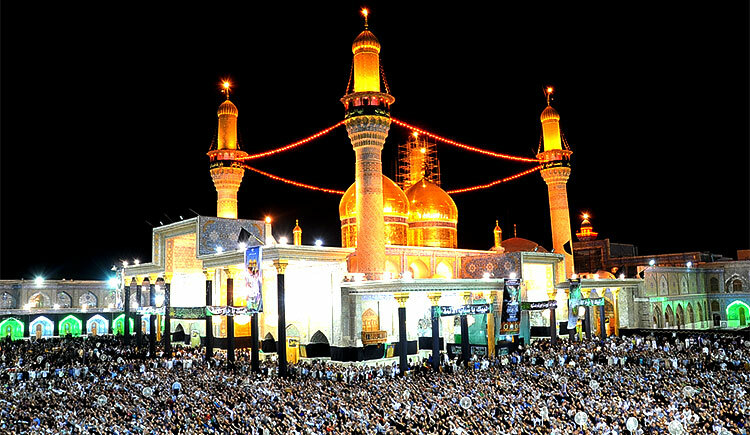 Imam al-Jawad(A.S.) wrote to one of his disciples: We are only ladling from this world. He whose belief and religion are the same as his acquaintance will surely accompany the acquaintance everywhere. The life to come is surely the remaining abode. A cameleer who took Imam al-Jawad (A.S.) from Medina to Al-Kufa asked for more money after the Imam had given him four hundred dinars. The Holy Imam (A.S.) said: How strange this is! Do you not know that Allah's increasing gifts will be stopped when the servants stop showing Him gratitude? "Toba" depends upon four things: sincere regrets, verbal "istighfar", deeds and determination never to repeat the sin. Don't pretend to be Allah's servant and be His enemy in privacy. Don't be God's friend in appearance and his enemy in secret. Sincerity is the best of all worships. Relying on Allah is the price of every valuable thing and the ladder to every treasured thing. To show a matter before preparing for it properly is spoiling it. Love is attracted due to three traits: being just in social dealings, assisting others in hardships and having a pure heart. Four things are required to do anything: health, independence, knowledge and divine assistance. Three deeds are performed by the believers: following the wajibaat, abstaining from sins, and not neglecting the religion. Whoever had three thing, will never regret: 1 - Refraining from haste, 2 - Consulting 3 - and depending upon God when decision making. Our wealth and soul are of God's pleasant gifts (to us) and deposited trusts, they cause happiness and pleasure as long as we enjoy them, and reward is for whatever is taken (from us), so whose grief overcome his patience his reward is lost, and we seek refuge to God from that. Refrain from association with the evil person, because he is as the bare awars having a beautiful appearance (but) an ugly effect. Delay in performing works always (cause) perplexity. Increase of blessing is not interrupted by God, unless thanksgiving is interrupted by slaves. Disclosing something before its firmness causes its destruction. Dependence upon God is the price for any valuable thing and is the ladder for any eminent matter. The one, who doesn't know the way in, has a problem finding the way out. If move calmly, get to the aim or close to it. The one who leaves compromise with the people faces discomfort. Whoever worked without knowledge, his destruction is more than his rectification. Have precaution according to the fear. Four things aid the human in his work: soundness, not needing, knowledge, and success. The one aware of oppression, the aid to it, and the pleased with it, all three are partners. Human's death due to sins is more than death by fate, and his living due to benevolence is more than living due to natural life time.